Special Agent Dale Cooper endured a lot during the span of Twin Peaks’ run, and although he could always rely on the Great Northern or the Double R Diner for a caffeine fix to keep him going, he undoubtedly deserved to kick back at the Roadhouse for a cold one at the end of the day. Perhaps Twin Peaks fans can cheers on his behalf because they are soon getting a beverage counterpart to go with their damn fine coffee. David Lynch collaborated with Danish microbrewery Mikkeller to produce three different beers that will launch this weekend at Lynch’s second annual Festival of Disruption in Los Angeles. The trio includes a Log Lady Lager, Red Room Ale and Damn Good Coffee Stout, which uses the filmmaker’s own David Lynch Signature Cup Organic House Blend. Lynch was heavily involved in every aspect of the process, from the initial conceptualizing phase to sensory analysis and tasting. The filmmaker also partnered with the brewery’s art director Keith Shore to conspire about packaging ideas. 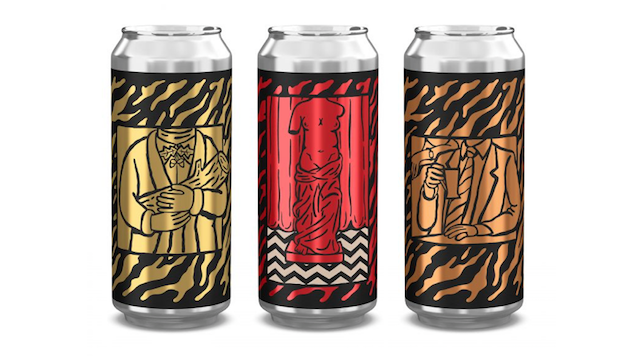 Those attending the Festival of Disruption are enviable, but those who aren’t will at least have an opportunity to snag a can of Twin Peaks beer from Mikkeller locations in Los Angeles, San Francisco, Oakland and San Diego.